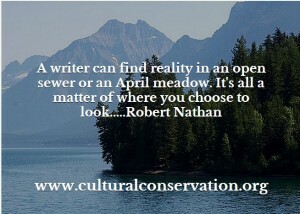 Robert Nathan was a master of satiric fantasy and the author of over forty books. He often wrote about people who were romantic, gentle, and whimsical. He said, “A writer can find reality in an open sewer or an April meadow. It’s all a matter of where you choose to look.” When other writers insisted that only the scandals and violence reflected reality, he had a different point of view. His outlook tells us that we shouldn’t apologize for seeking inspiration and beauty in a world that often ridicules us for doing so. Too often we are apologetic and defensive in our response to such arguments. Robert observed that the April meadows that inspired him were real too and we should proud and enthusiastic in seeking to find them. The beauty and delight of language awaits us all. Learn more about Robert Nathan and the delight of language through Cultural Conservation. Click here.